A white flag, with the town seal in the center. The seal contains a shield containing a red roofed house, and in the background is a depiction of a village, and below a yellow ribbon with the incorporation date. Above is a plow. The town and state name are in white letters on a black ring around the seal. 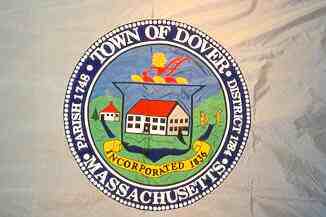 Dover is in Norfolk County.